For months, Kelly Burke hadn't been able to find what was causing the persistent pain in his neck. But then he came to Mayo Clinic, and doctors found a cause — and a solution. Kelly Burke lay in a daze inside the intensive care unit at Mayo Clinic's Florida campus, sure that the two shadowy figures who had appeared before him were there to lead him over to the other side. "I thought I was dead, and I went 'Wow, so this is what it is like to be dead,'" Kelly, a former Houston County, Georgia, district attorney tells the Macon, Georgia, Telegraph. Then another thought ran through his mind: "I can't believe Keith Richards (of The Rolling Stones) outlived me." Kelly, however, wasn't dead. Instead, he was suffering the effects of his pancreas having suddenly shut down, a result of an intense treatment regimen for skin cancer. The shadowy figures he'd seen were two angelic members of his care team who were there to nurse him back to health. It was an ongoing, delicate process that began after Kelly arrived at Mayo Clinic seeking help for the severe and persistent pain he'd been feeling in his neck for months. What that team decided, the paper reports, was to start by redoing Kelly's previous imaging scans. The new scans revealed something his doctors had not seen before. A squamous cell carcinoma that had been removed from Kelly's chin had somehow "gotten into a nerve and traveled all the way around to the back of his right ear and into his brain stem," leaving no trace or evidence of spread behind. So odd and rare was this occurrence that Kelly's care team at Mayo, the paper reports, "could not find a recorded case of it anywhere." Kelly recalls being told he wouldn’t survive without immediate treatment. Doctors put Kelly on an aggressive "30-day regimen" of daily radiation and chemotherapy treatments to try to eliminate the cancer permanently. More treatments would follow, including those that damaged his pancreas and forced him into the ICU. But then, on Feb. 1 — "a year to the day he found out he had cancer" — doctors shared the results of Kelly's most recent tests. "They came in and said, 'Wow, we've just never seen this. It's resolved. It's completely gone. We have no evidence that you had cancer,'" Kelly tells the Telegraph. And for that, Kelly tells us he'll be forever grateful. 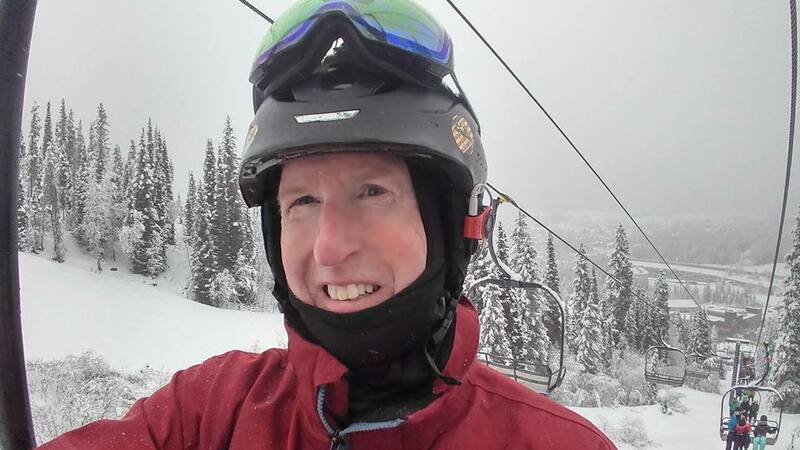 "I told my lead doctor when he first diagnosed me that his job was to get me back to downhill skiing so that I could teach my grandchildren how to ski," he says. "Since then, my wife and I have welcomed our first grandchild into our lives and all of my friends are amazed that I'm now back out skiing," Kelly tell us. "I really can't say enough about everyone at Mayo Clinic. I appreciate everything they've done for me." Give us something to appreciate by sharing your comments below. Then, use the social media tools atop this page to share this story with others.